archSCAN works with facility managers to organize and catalog their critical facilities documents and drawings. We provide on-site plan room clean-up services and help remove document duplications, along with creating a user-friendly drawing/document database that tracks the information about each drawing for fast search and retrieval at any time. The result is a major improvement in building operation and maintenance. Organizing and cataloging Architectural, Engineering, and Construction drawings has an immediate effect on building operations teams because they can do their jobs faster when they can find information faster. Our process helps eliminate major facilities maintenance headaches such as hunting and searching for critical project information or life safety drawings or working from outdated drawing sets. We help you know what facilities information you have and where to find it. Maintenance and repair tasks become easier, and when an emergency strikes, a document management system lets you locate the building or facility drawings you need, right away. We organize both paper and electronic documents and catalog them all in document management software using the metadata captured from each drawing during the organizing process. Our process allows us to identify duplicates regardless of medium (paper, blueprint, vellum, microfilm, microfiche), or electronic file format. For organizations that have documents stored in different types of file formats, we perform file conversions when a client needs to ensure all documents are accessible from the same system. Typical conversions include DWG to PDF files, TIFF to PDF, and Microfilm/fiche to PDF. archSCAN, LLC is the only company in the Mid-Atlantic Region that specializes in cleaning up blueprint plan rooms before a scanning project is begun. As shown in the stats above, we find that after the organization phase, fewer documents need to be scanned in order to fully digitize the contents of a plan room. We go on-site to our client’s facilities located within 100 miles of Baltimore, including Washington, DC, Annapolis, Northern Virginia, and Philadelphia. archSCAN has organized over 100 plan rooms since our inception in 2002. Many facility managers have told us that this project was the best money they ever spent. In addition, from preventive maintenance to emergency preparedness, our work has removed significant concerns for operations managers. Please take a look at some of our remarkable before and after pictures. If you find your organization or team wasting valuable time just trying to find the blueprint that shows the cut-off valves, circuit switch, or roof diagrams, our offerings may be exactly the solution. 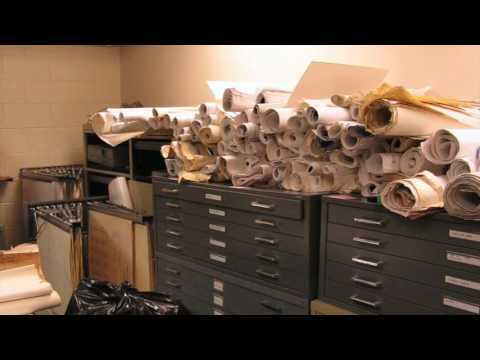 Are your facilities drawings in disorganized piles? Are critical construction project documents buried under stacks of paper? Have you wasted valuable time locating the blueprints for cut-off valves, circuit switch, or roof diagrams?